There are times after a gratifying meal when all that is needed is one bite of something sweet. These luscious truffles are perfect for such an occasion. We sometimes serve them after dessert if it is a special event, or offer them to guests as a treat to take home. These are one of the few desserts we serve with a dry red wine, because wine is used to flavor them. They taste especially delicious with our reserve Cabernet wines because the tannins have softened, leaving lots of fruit flavors that really sparkle in conjunction with the rich chocolate. Melt the chocolate in the top of a double boiler set over a pan of hot water. Remove from the heat. Add the butter and cream and stir until smooth. Stir in the wine. Transfer to an 8-inch nonstick loaf pan, cover tightly with plastic wrap, and refrigerate for 1 1/2 hours, or until firm. Put the cocoa powder in a small bowl or pie tin. Remove the chocolate mixture from the refrigerator and shape into small balls (about 1 inch in diameter) using the small end of a melon baller or a small ice cream scoop. (To make the shaping easier, dip the melon baller in hot water before and between shaping.) Arrange the balls on a plate and refrigerate for 2 to 3 minutes, or until firm and dry. Drop the truffles into the cocoa and roll them around to coat completely. Repeat until all of the chocolate is used. The truffles can be stored in an airtight container in the refrigerator for up to one week. Let stored truffles sit at room temperature for 20 minutes before serving. 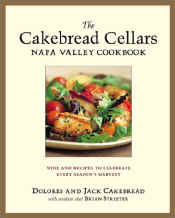 Enjoy with Cakebread Cellars Cabernet Sauvignon Reserve or another Cabernet Sauvignon with soft tannins and lots of cherry and berry flavors.